The eyes of Irish cokeheads aren’t smiling tonight. This was no fluke…the yacht had been identified as the carrier of a drug shipment before it even left the Caribbean. American “black radar” tracked it across the Atlantic as a global narcotics-fighting consortium prepared to seize it when it landed. Then the cheesily-named yacht got caught in a gigantic storm and had to be rescued. Attend the tale of Operation Seabight! 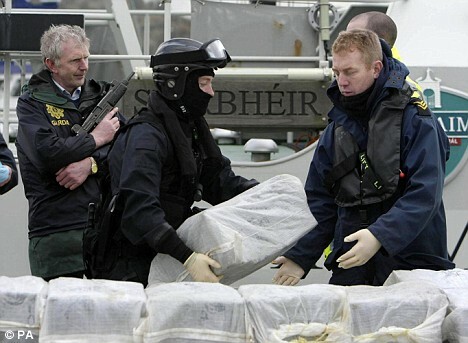 OPERATION Seabight will go down in history as a landmark Irish anti-drug smuggling operation. The critical element of the operation is not that it delivered Ireland’s largest cocaine seizure with the recovery of an estimated €675m worth of high-grade Colombian cocaine. In fact, the major element of Operation Seabight is that, for the first time, it illustrated the potential of police forces in numerous countries liaising and exploiting military-style technology in the war against drugs. The startling reality is that the 60-foot sloop ‘Dances With Waves’ was doomed to arrest from almost the minute it left the Caribbean. As the old sloop battled gales and mountainous seas to cross the Atlantic with her cargo of 1,875kg of cocaine, her every movement was watched. It is a certainty the yacht was tracked on radar in the Caribbean by a long range P-3 Orion surveillance aircraft which is at the forefront of the US war on drugs, probably in collaboration with the Drug Enforcement Agency (DEA). The Orion, used by both the US Customs Service and the US Navy along with other forces, can patrol for up to 17 hours at a stretch operating from a base in Florida to cover the Caribbean. It uses sophisticated inverse synthetic aperture radar (ISAR) to produce a two-dimensional high-resolution image of a ship. Suspicions over ‘Dances With Waves’ mounted when she was detected in waters off Trinidad & Tobago. 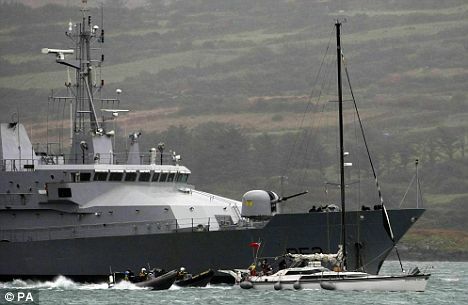 Just 17 months ago, the catamaran ‘Lucky Day’, whose 1,554kg cocaine shipment was seized in Dunlough Bay in west Cork, began her transatlantic journey from precisely these same waters. US satellites — several with military-style surveillance capabilities — tracked the sloop as it continued its slow journey. ‘Over the horizon’ or ‘black’ radar — almost impossible to detect — was used to monitor every movement of the sloop. The radar is used to detect targets at very long ranges, up to thousands of kilometres. Such radars are used by the US Navy, which can track ships up to 3,000 kilometres away, and operate in an anti-drug role from bases in Virginia to cover the Caribbean and Central America, and from Texas to cover the Atlantic and Pacific. So precise was the monitoring operation that European and US police forces knew the sloop was in trouble in the stormy seas in the hours before she was boarded. The astonishing level of surveillance was the result of co-operation between some of the world’s leading police and anti-drug agencies. Four agencies in particular delivered the ‘Dances With Waves’ seizure — the Portugal-based Maritime Analysis and Operations Centre (MAOC); the elite Serious Organised Crime Agency (SOCA) in the UK; Ireland’s Joint Drugs Taskforce; and the DEA, so beloved of Hollywood crime writers. Between them, the four agencies can access virtually unlimited resources — and can bridge the sophistication gap that, for so long, favoured the drug smugglers. Yesterday, gardai and Naval Service personnel refused to comment on the precise intelligence and assets used to track ‘Dances With Waves’. The other amusing point is that the yacht was about to capsize, dumping its precious cargo into the sea, when the authorities rushed in to save the day. It seems they were as interested in saving the blow as the smugglers were! THE luxury yacht carrying around €700m worth of cocaine was of the verge of capsizing when naval officers swooped on Thursday morning. 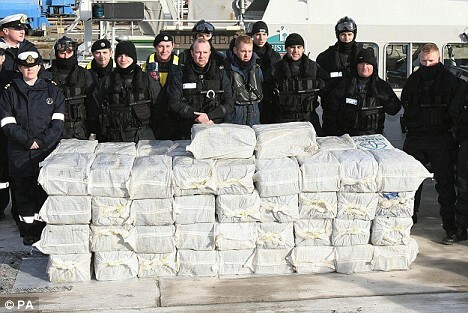 The 70 bales of cocaine were within minutes of being washed into the sea, as happened off the Cork coast last year. Authorities were forced to board the ship in “horrendous weather conditions” to prevent evidence being lost in the seven- metre swells. Gardai believe that the traffickers underestimated the stormy Atlantic conditions. Although the 60ft craft could travel at high speeds, it was not designed for rough weather. Minister for Defence Willie O’Dea said there were “huge waves” when naval personnel made their move. While praising the operation, Minister O’Dea said that he would not be going to Cork. “They’ve taken the vessel in and are doing an inspection of the yacht now. “The lads did the job, let them take the praise,” he said. The drug war is largely a waste of resources, in our opinion. But as long as we’re fighting it, I guess you gotta concur with Minister O’Dea and congratulate the lads on a job well done. As we say here in America, they’re good po-lice.